This boy is waiting & ready for his Forever Home! Hogan is a big lover boy & will make a wonderful, loyal companion for someone looking for a big boy that has energy to burn playing & going on walks! We are guessing him to possibly be an American Bulldog/St Bernard mix & weighs 86 lbs. Due to his size & energy, teenaged children are recommended. 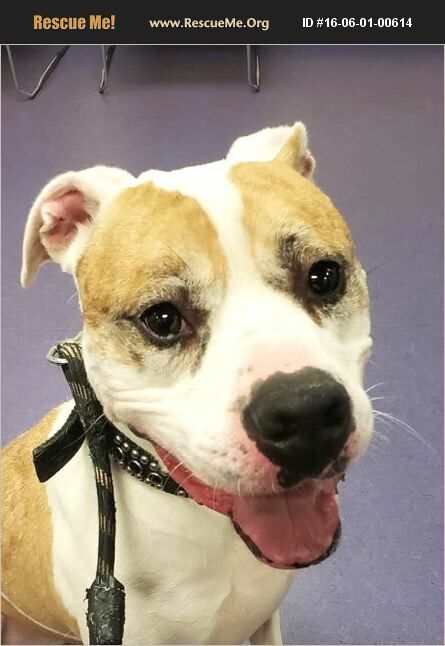 Hogan is guessed to be approximately 4 years old, neutered, Heartworm negative, crate-trained, house trained, up to date on all vaccines, parasite-free and microchipped. Hogan is dog friendly with a proper introduction. He does not do well with cats. He is smart, affectionate, LOVES car rides & playing fetch! He can be strong on the leash so needs a strong handler that is experienced with these types of breeds & someone that can continue training & directing him. Unfortunately, Hogan has had to go into boarding because we lost his foster we do not have an available foster for him. Hogan needs his Forever Home soon! Please consider meeting this boy & seeing what a great dog he is! Hogan's bred mix is a guess & only a DNA test would tell the whole story!